A thick slice of warm banana bread + a cup of coffee is the ultimate comfort food (in my mind), and in the winter even more so. And the best part — a hearty banana bread base pairs well with so many different flavors, so the possibilities are truly endless! For now — I’m drooling over this loaf, which marries nutty tahini with the sweetness of dark chocolate chunks and the saltiness of coarse sea salt flakes (which, by the way, is my latest baking obsession. #seasaltoneverything). This loaf will probably definitely not last a week in our house… it’s that good. Enjoy! Preheat oven to 350º F. Grease a loaf tin, and set aside. Whisk together olive oil, tahini, honey, coconut sugar, eggs, and vanilla. Fold in the dry ingredients until just fully combined — do not overstir. Fold in the dark chocolate chunks — again, being careful not to overstir. Pour mixture into loaf tin. Top with a whole banana, sliced lengthwise. Bake 45-50 minutes, until a toothpick inserted in the center comes out clean. As soon as you remove banana bread from the oven, sprinkle generously with flaky sea salt, then leave to cool. Cut into thick slices, and enjoy warm with a cup of coffee! One of my all-time favorite brunch spots in New York City, Two Hands, is home to a legendary house banana bread that they top with espresso marscapone, honey, and puffed buckwheat. I’ve never been able to try it because of my dairy allergy, but after years of pining, I decided to recreate it on my own at home. My version is gluten- and dairy-free, the marscapone is entirely vegan, and the banana bread can easily be made vegan as well if you substitute a flax egg for a real one. Two slices makes a weekend breakfast that will keep you full for hours, thanks to all the fiber and healthy fats in my version, and you’ll love knowing it’s free of refined sugars. Instead of straight puffed buckwheat, I topped my toast with Trader Joes’ Super Seed & Ancient Grain Blend, which has chia, flax, hemp, red quinoa, amaranth, and sprouted buckwheat and millet. Spray a loaf pan with cooking spray and set aside. In a large mixing bowl, combine the dry ingredients (flour through cinnamon). In a separate medium bowl, whisk together wet ingredients (bananas through vanilla extract). Add the wet ingredients to the dry ingredients, and stir with a wooden spoon until just combined. Be careful not to over-mix. Fold in walnuts, if using. Transfer mixture to the loaf pan, and bake for 45-55 minutes, or until a toothpick inserted in the center of the loaf comes out clean. Instructions: Combine all ingredients in a high-speed blender until a thick, fluffy marscapone-like consistency has been reached. It took me two rounds to perfect this recipe. I am picky with my baked goods, and having to bake gluten-free makes me even pickier. My goal is always to create a baked good that I could put down in front of someone, without telling them what’s in it, and not have them say it’s “pretty good for being gluten-free”, but that’s it “REALLY good”, period. I think I achieved that with this muffin. Basically, this muffin is the perfect solution to your 3 PM energy crash. It gives you complex carbs and healthy fats to prevent the “hangry” from coming on, and the staying power to get you through till dinner. It gives you a little dose of caffeine with the ground espresso, and it has chocolate in it. Chocolate just makes everything better. Preheat your oven to 350 degrees F. Spray a muffin tin with nonstick spray, or oil with a little olive or coconut oil. In a large bowl combine all wet ingredients (eggs through apple cider vinegar, above). Whisk until well combined — your batter should be smooth and creamy. Next, add in all dry ingredients (except for the chocolate chunks). Stir to mix, then fold in the ½ cup of dark chocolate chunks. Spoon your batter into 9 muffin cups, and top with a few additional chocolate chunks. Bake for 20-25 minutes. Let cool for about 5 minutes, and then enjoy! 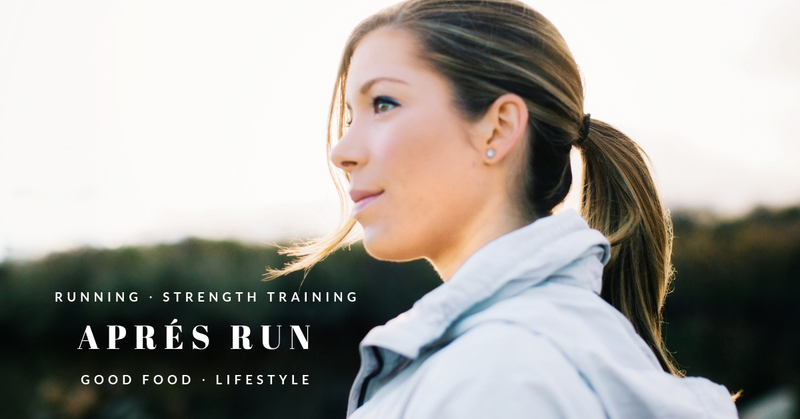 Welcome to APRÉS RUN, where I share recipes, strength training workouts, training talk, and more. I am passionate about running, fitness, healthy eating, and wellness. A former D1 runner, I run for fun (and for myself) now. I believe running is the best way to reduce stress, challenge your body, get to know yourself, and experience the world. I believe any one who has a body can be an athlete. I am not a doctor, nutritionist, or PT — but I have worked with lots of doctors, nutritionists, PTs, and strength training professionals over my career. These are just my experiences and informed opinions from 12+ years in the sport. Sharing a personal (!) but fun post on the blog tonight: The Best Nutrition Changes I’ve Made for Body Comp, Performance, and Happiness 💓 . I’m a firm believer that the #1 way people learn about their bodies and nutrition is through experience (AKA a whole lot of trial and error). Everyone goes through a unique relationship with food, and women especially. Here are what have been the biggest difference-makers for me, but I’d love to know... what have been the best changes you’ve made for your body and your happiness? !